McDonough, GA – A local rescue organization and Doobert volunteers transported a dog from Lavonia, Georgia to a more permanent home in McDonough, Georgia. Gabbie was seized from her owners and taken to NE Georgia Animal Shelter in Lavonia, Georgia. They immediately rushed her to the vet finding out she was bred until she could no longer have puppies. Since she could no longer have puppies, her family couldn’t make any money off of her and they turned to using her as a bait dog in dog fighting. 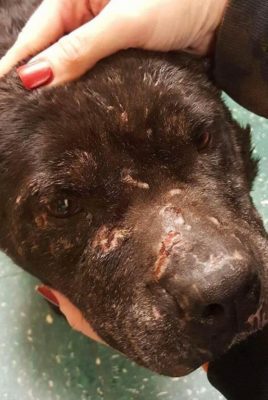 Dog fighting led Gabbie to have the conditions she currently has. She is in private boarding where she will receive the rest of the vet care that she needs. Gabbie was transported from a shelter in Lavonia, Georgia to the temporary foster in Lindale, Georgia. After she spent time at her foster, Gabbie moved to a more permanent situation in McDonough, Georgia. Volunteers use the custom-built software on Doobert.com to save animals by volunteering, fostering, and/or transporting animals. This software helps solve the most difficult aspect of coordinating animal rescues: transportation. With Doobert.com, animal lovers around the country come together to bring animals to their forever homes. Volunteers and organizations can sign up for free to rescue more animals at http://www.Doobert.com.